A yard of Heaven! 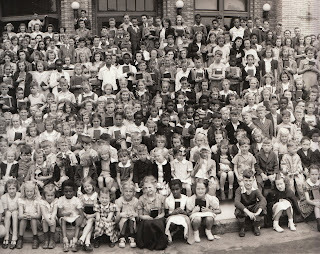 "Yard Long" or panoramic photographs are frequently seen but seldom as crisp as this pair showing 1942 Bible School Students and their teachers from Grand Rapids, Michigan. Too big for my scanner, and a shame as they are splendid. There is a slight "row" in one row...(second row on the left, detail shown) but all in all, the little monkeys behaved and each holds their little Bibles with respect. Photographed at the height of World War Two, it is exceptional to realize virtually all these children had a father serving in the Armed Forces. 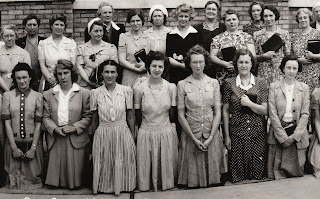 We can also surmise most of the teachers had husbands or sons serving. 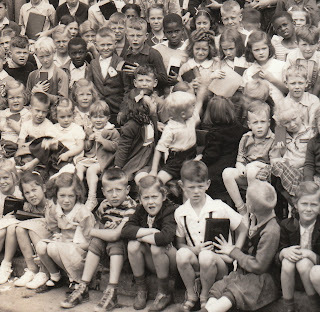 A beautiful pair of integrated images at a time when segregation was still common, and together a splendid example of what panoramic photos are for. The special cameras used for these giant pictures were developed as early as the late 19th century and their high resolution is still a marvel.Harshberger began commercial photography in Grand Rapids in 1921 and closed the shop in 1949.